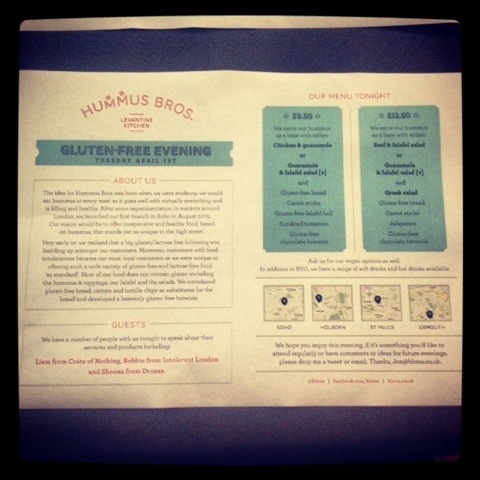 Last week Hummus Bros invited myself and a bunch of other lovely gluten-free bloggers, company reps and coeliacs to sample their new GF menu. Hummus Bros is one of those cool London restaurants I’d been meaning to visit for yonks. I may have visited quicker if I had been aware of their super useful interactive allergen menu, or their amazing homemade hummus (Hummus? Houmous? Hummus. ), or the extent to which they accommodate coeliacs and gluten-free dieters. 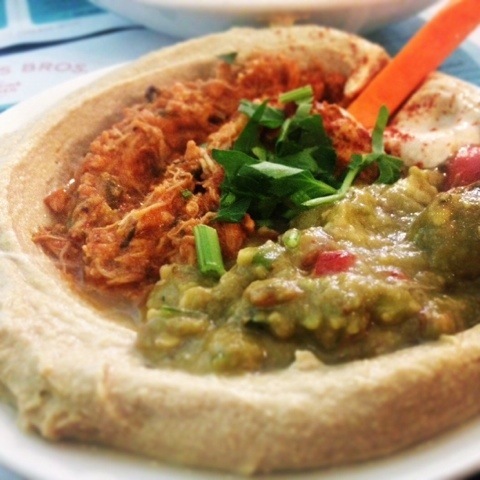 Hummus Bros serve up simple, fresh meals, all based around their staple homemade hummus. That evening they had prepared a set menu for us made up of a selection from their new gluten-free menu. I love the start-up story. D (my +1!) and I agreed that the falafels, the hummus and the brownie were the best things on the menu. The falafels were quite possibly the nicest I have *ever* tasted, and I would have quite happily eaten a meal of them and the hummus alone. The brownie was positively sinful. It was gooey and melty and reminded me of the legendary Leon flourless chocolate cake (recipe reproduced here), which in D’s expert opinion is The Best Chocolate Cake ever. The food is made fresh, and you can taste the difference – no reheated microwave mush here. The proprietors told us that there is very low risk of cross-contamination as almost everything on their everyday menu is gluten-free, and the few things that aren’t are bought in and prepared separately. It is reasonably priced fresh food in the same sort of vein as Leon. Not fine dining, but good for grabbing a healthy and most importantly safe bite to eat. Though I absolutely commend Hummus Bros for creating a gluten-free menu and taking the needs of people with coeliac disease (and other food intolerances / allergies) into consideration, I had some criticisms. They serve a gluten-free bread on the menu, (yay! ), but they have chosen to use DS Brown Multigrain Loaf (…oh.). While this is by no means the worst gluten-free bread available, it is not one that I would choose to eat. The bread was served untoasted, and to be honest for me it let the meal down a bit. Why not source some really great local GF bread from the WAGfree bakery, or order in bulk from the Wheatfreebakeryonline? (which I haven’t tried myself but have only heard good things about). This could easily elevate the meal, though I appreciate there will be cost / expiry dates to consider here. D is a meat fiend and was less impressed with the meaty part of our meal than the vegetarian creations. My favourite part of the evening was getting to chat to other coeliacs. Although I know a few people in my life who eat gluten-free foods, I very rarely come into contact with actual diagnosed coeliacs. It was really great to talk about the everyday frustrations, compare stories of accidental glutenings and the inevitable fruit salads (#fruitisnotapudding !) and come away with a list of new products and restaurants to try. 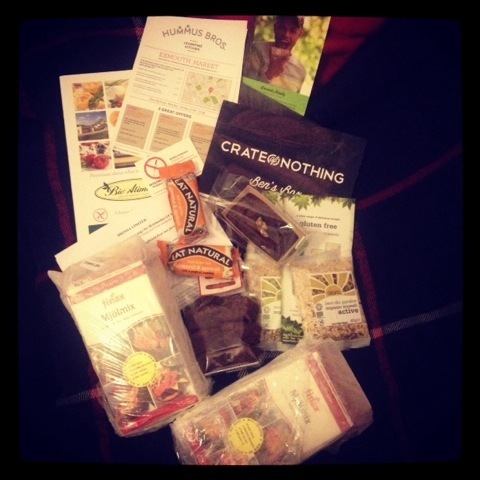 Inbetween stuffing our faces and chatting away, we heard from representatives from Drossa, Crate of Nothing and the Intolerant London blog.We also received goody bags full of gluten-free treats (!) which I am very much enjoying working my way through. All in all it was a fun evening. It is a wonderful idea to host an event like this, and I would encourage other restaurants to try it. Who better to give you honest feedback and spread the word about your gluten-free offerings than coeliacs and gf dieters themselves? 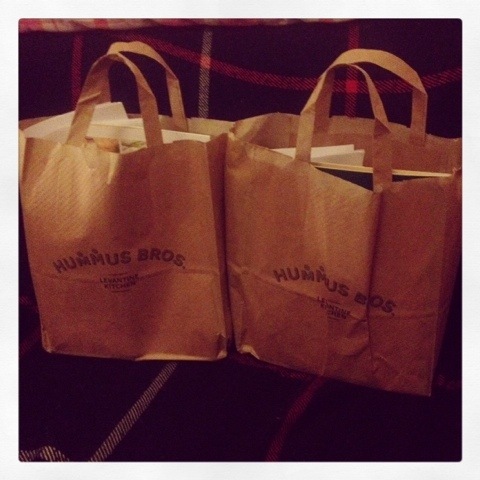 Hummus Bros has branches in Soho, St Paul’s, Holborn and Exmouth Market. I can confirm that the meat resembled what I give to my cat, and had a twang to it which I can only imagine is similar to what dogs eat. It was a real shame as the ‘hummus’ and falafels were great. Don’t mince your words, David! Haha. I thought the meat was okay, but nothing great.